Before the tsunami suffered Aceh on December 26th, 2004, Lampuuk Beach was a favourite tourism destination for tourists visiting Nangroe Aceh Darussalam. The surrounding location offered the fresh air and tranquil nature to them who visited the location. However, after that terrible tragedy, the beach began to deteriorate. Rubbishes were everywhere and casuarinas fell down splashed by the tidal wave of tsunami. Now, Aceh regional government has been attempting to refurbish the location around Lampuuk Beach to attract many tourists following the Visit Indonesia Year 2008. On weekend, people visit the location for recreation and some other, especially researchers, use the location as an object for certain research as well. Though you are not allowed to swim, you can still do activities such as surfing and sailing. In addition, some peddlers along the coast are ready to serve the best foods and beverages for you. Nearby the beach is a cement factory which suffered the most horrible damage when tsunami occurred in 2004. Next to the cement factory is an elegant mosque which kept standing firmly when tsunami suffered Aceh. Considering the location is the most terrible location when tsunami suffered Aceh, the local government decided to erect a monument to commemorate tsunami tragedy. This white sand beach offers you the fresh air atmosphere, special for you who are looking for tranquil holiday ever. You are not allowed to swim there, but surfing and sailing are exceptions. Viewing sunset on evening is an unforgettable moment for those visiting the beach. In addition, there is a green golf field for you loving playing golf. 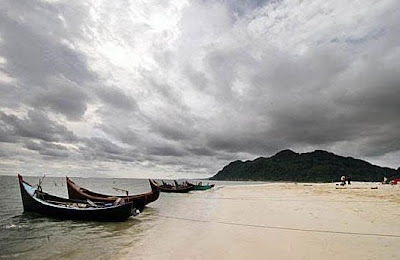 Lampuuk Beach lies in the western coast of Aceh Province in the northernmost part of Sumatra Island. The destination is located administratively in Lhoknga Sub-district, Aceh Besar District. Since you have just arrived at Banda Aceh City, the capital of Aceh Province, you can reach Lampuuk Beach by taking any public transport. To reach the location, you will spend about 20 minutes trip or about 20 km in distance. In addition, you will spend about 35 minutes to reach the location if you take public transport from Lhoknga. The entrance ticket for enjoying the magnificent nature of Lampuuk Beach was around IDR 1.500 before the tsunami. However, the precise amount of the entrance ticket to the location after the tsunami is under confirmation. Lucky for you having visited Lampuuk beach before the tsunami tragedy occurred in Aceh since the number of cottages could be easily found. However, it is hard to find lodgements or cottages around the location after the tsunami tragedy in 2004 ago.